Still posting more of my Fox in Flats style challenge outfits from May. As the temperatures started dropping, I had to add some scarves as well. It's a nice way to add colour in autumn or winter. They are also easily washable for life with baby, although I haven't yet found a way to stop baby grabbing and tugging on them sometimes! The style challenge for the day was 'back track', so I wore this tank with the cut-out detail on the back. You can see it better on instagram. As I was taking the photos I was slowly realising it was much colder than I expected, much too cold for bare arms, so I had to run back inside and grab a jacket before we went out. Baby and I had planned to meet up with a mother's group in the park, but as I was running a little behind with all the errands I had to do that morning and I was worried how baby would cope in the cold, we decided to skip it and go home early. Last worn: turquoise scarf, printed tank, purple skinny jeans, Converse, RM aqua mini MAC. Other ways to wear: turquoise scarf with a printed dress, printed tank and maxi skirt hiding a second trimester baby bump, purple skinny jeans in spring, Converse and spring dresses, mini MAC and a maxi dress. The style challenge for the day was 'simple formula' which worked out well for me as it was another morning where I was running behind! The formula I went with was 'grey tee, skinny jeans and great accessories'. I thought the scarf added a nice touch of colour, and some print mixing with the cardi. Just needed a cosy and comfortable outfit. Baby T and I went to the library in the morning, and then playgroup later on. It was good to be able to take off some layers as it heated up through the day. Last worn: brown cardigan, neon leopard print scarf, grey tee, skinny jeans, brown boots, Rebecca Minkoff Love bag. Other ways to wear: leopard print scarf with a more casual skinny jeans outfit, grey tee and maxi skirt, skinny jeans with printed kimono, leather boots with a dress, grey RM bag and neutral outfit. Linking up with Pleated Poppy, What I Wore, Style Me Weekly, I Feel Pretty, Style Me Wednesday, Oh Hey Girl, Trendy Wednesday, Thursday Favourites, Thursday Fashion Files, Throwback Thursday, Fashion Friday today. You have the best scarf and bag collection! I'm obsessed with both of these scarves, so pretty and the perfect pop to your outfits! Thanks Ira! I do have a bit of a Rebecca Minkoff collection going - the sales are just too tempting on her bags, haha! I have to say your scarf collection is pretty fabulous! (Second place only to your bag collection, of course!) I love the beautiful, bright turquoise color of that first scarf (and bag). Such a fun touch to the outfit! haha thank you! I think for once I have more scarves than bags after a bit of a clear-out! Both of these are fab! I love the touches of turquoise in the first look. And the scarf in the second? I am obsessed. You have the best handbag collection!! I absolutely love both of these and despite it being to warm here for scarves right now I want to wear both!! The color combo in the first look is SO SO pretty, and that scarf adds so much fun to the second look! That second scarf and boot combo is amazing! I love the coral/tan color combo. That print and aqua looks great together! I love your second outfit also! The scarf just adds a spark to an already great looking outfit. Now I kind of regret not having a single pair of skinny jeans in my closet:) You make them look so cool. I'm not a fan but on you they look so perfect. The second outfit is fabulous! 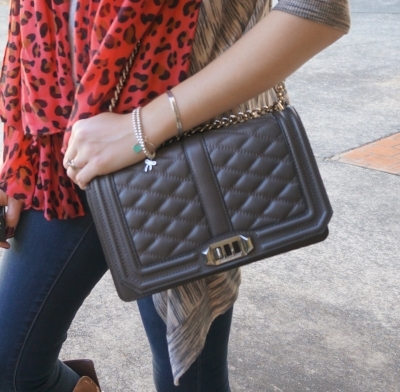 I really like the boots and the bag...and than animal print scarf is the perfect addition of colour. Yes, I had a pair of jelly sandals when I was a kid and if my memory is to be trusted they were bright red. I really like your jelly sandals and this outfit is a great match for them. The pastel blue jacket is so divine...and that striped dress looks amazing on you. With that model body, I'm sure you can rock every and any dress. I'm happy to hear you have a new job you're really happy with...and a new make up palette and haircut to match:) Small changes can make such a difference. love your bag collection! beautiful! 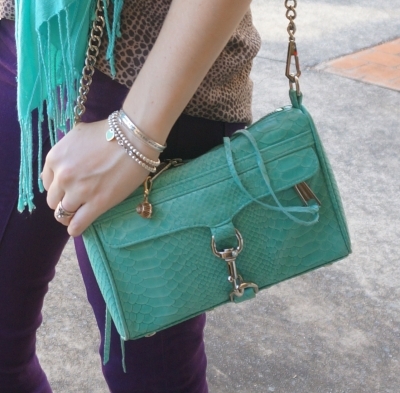 Looove the color of that turquoise Minkoff! So pretty! I love the colours in this outfit! Teal and purple look awesome together. Great necklace too! A nice pop of color is the best way to spice up a casual get up. You nailed that style challenge with that gorgeous red scarf! Oh I am so digging the first outfit!! The aqua blue scarf and bag with the colored jeans absolutely makes this outfit stunning!!! I'm not normally a leopard print girl but in accent pieces I take exception -- your scarf being a definite "I would totally wear that!" Oh my gosh! Those purple pants are absolutely gorgeous! Those boots are divine! I am looking at the Spendless dupe with intent now! I agree that scarves are a nice way to add color to an outfit. I love both of your scarves in these outfit and totally love the color combo in that first outfit. Thank you for joining TBT Fashion link up and hope to see you next week. Have a great weekend! That second look is outstanding Mica ! you look like a life size doll.